Beth Moore wants readers to know if God could lift her out of the pit, He can get ANYONE out! She admits she wasn't just a visitor; this former pit-dweller had to be delivered from acres of life-accumulated dirt, bone-chilling darkness, spirit-deadening anger, heart-breaking desperation and mind-numbing confusion. The permanent lessons she learned in her desperation-shared in this very personal book-are lessons of hope for all of us. While she deeply empathizes with the hows and whys of life in the "pit," she continually points readers to the deliverance that awaits. Deliverance is for everyone, she proclaims-no matter how you got stuck, no matter how long you've been down, whether you think you deserve it or not. And in her straight-talking but loving style, she reminds readers that deliverance can begin for them this very day. 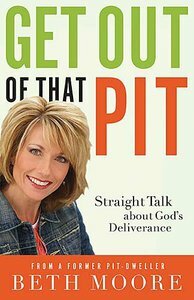 About "Get Out of That Pit"
Beth Moore was born Wanda Elizabeth Green in 1957, on an Army base in Green Bay, Wisconsin, the fourth of five children. She was raised in Arkadelphia, Arkansas, where her father - a retired army officer - managed the local cinema, and it was there that Beth's lifelong love for stories began. She loved to tell them, write them, and be told them. But the story that captured her heart more than any other was not told in a movie theatre. It was the story told in Sunday School, about Jesus, a Saviour who loved children and who thought she was special. A seed was planted in her young heart that would grow to a passionate love for Christ. At the age of 18, Beth sensed God calling her to work for Him, although she couldn't yet imagine what that might involve. She graduated from Southwest Texas State University with a degree in political science, and would later receive an honorary doctorate in humanities from Howard Payne University. She married Keith Moore in 1978 and soon after the Lord added Amanda and Melissa to the family. Beth's involvement with the Bible intensified when she took a doctrine class at her church. Her teacher was Buddy Walters, a former college football player who taught the Scriptures with tears streaming down his cheeks. She fervently prayed for such a passion for God's Word. Beth founded Living Proof Ministries in 1994 with the purpose of teaching women how to love God's Word and put it at the centre of their lives. She has written numerous books - including Breaking Free, Believing God, The Patriarchs and James: Mercy Triumphs - that have been read by women of all ages, backgrounds, and denominations. Beth runs conferences for women across the United States annually, and has also taken her ministry to many different countries, including Ireland, England, Singapore, the Philippines, Puerto Rico, India, Angola, Kenya, and South Africa. Since 2004, Beth has conducted a radio ministry 'Living Proof with Beth Moore', and has a weekly spot on the television program LIFE Today. Ever the storyteller, Beth is known for enlivening her teaching with stories and poems written from the perspective of biblical characters. She communicates with great energy, humour, warmth, and grace. For over a quarter of a century from the 1980s, Beth attended the First Baptist Church in Houston, Texas, transferring in 2011 to Bayou City Fellowship, where her son-in-law Curtis Jones is the founding pastor. Beth and and her husband Keith enjoy travelling, hiking, drinking coffee on the back porch, eating Mexican food, making each other laugh, walking their dogs, and being grandparents. Both of their daughters, Amanda and Melissa, serve with Living Proof Ministries, and Amanda's husband, Curtis, serves on staff as an associate speaker/teacher. Customer Reviews For "Get Out of That Pit"